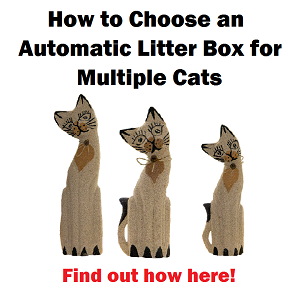 CSF-3XL Automatic Cat Feeder Combo - Is the CSF-3XL suitable for your cat? 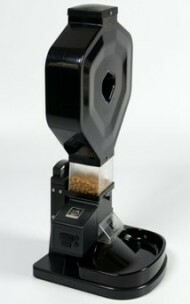 The CSF-3XL is the combo version of the CSF-3 Super Feeder that includes a 24 cups capacity hopper and this particular combo comes with an analog timer. You can find this same combo with digital timer. The CSF-3XL combo with analog timer has a timer that can be programmed up to 48 feeding cycles by day, with a minimum of 30 minutes apart from each meal. The analog timer has a LED light to indicate when it is ON and very easy to program pins used to trigger the feeder up 48 times daily (or 24 meals by day 1 hour apart if you want). 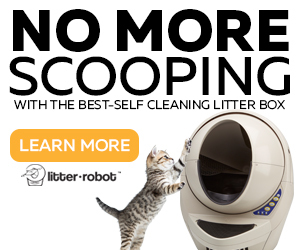 The Super Feeder has a larger chute opening and installed poly-carbonate chute cover to keep away your determined cat. For very best performance in dispensing accuracy, small 1/4″ round kibbles like offered, for example, by Science Diet or other brands are recommended. It has to be assembled with a screwdriver. When assembled and mounted to supplied mount/platform, the size of this unit is 12 x 11 x 21 inches tall with one clear extension installed (as shown in the picture). 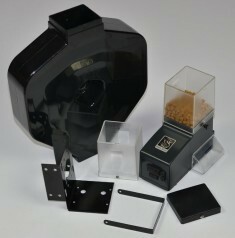 You could also mount the Super Feeder to a wall to keep your very wild cat away from the hopper! Ability to dispense from a fraction of a cup to several cups as portions. Capacity to dispense up to 48 feeding cycles in 24 hours. 30 minutes minimum interval between each cycle. Analog timer with LED light indicator when “ON”. Large chute opening and installed poly-carbonate chute cover to keep away cats obsessed with food. Special dishwasher-safe bowl made high-quality materials, specially designed to split and spread pellets for better food distribution around the bowl. A hopper with 24 cups capacity which you can stack whether on top of one or two clear extensions or if you prefer, directly on the feeder. Can be mounted to a wall or if you want using your own mount (piece of lumber) instead the short stand for those smart cats. 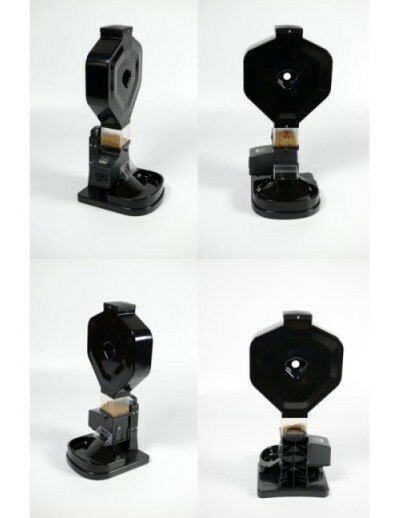 A heavy-duty black ABS stand with rubber feet. Two clear 2-Cup hopper extensions. A 24 cups capacity hopper. New bowl with a bowed splitting dish. Various home automation system can be used to operate the Super Feeder remotely. A webcam system also has been used by some customers. If you can turn on an appliance by phone or other means, you could do that with this automatic feeder. What are the Pros and Cons of the CSF-3XL automatic feeder combo? Capacity to dispense from a fraction of a cup to several cups at a time. It has the ability to dispense up to 48 feeding cycles in 24 hour period. Minimum of 30 minutes intervals between each cycle. Very easy to program analog timer. Bowl with a bowed splitting dish for wider distribution of kibbles. 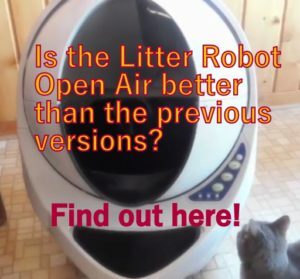 A tough and poly-carbonate chute cover protective device to keep your cat away from the chute. Can be mounted on a wall, cabinet or across a corner wall. Hopper with a capacity of 24 cups dry food. 2 cups transparent hopper extensions. Can be used with your own digital timer. It could be used with a home automation system. Personalized customer service for this product. Tricky to be assembled (it is easy following the instructions on YouTube). It is not setup to work with batteries. 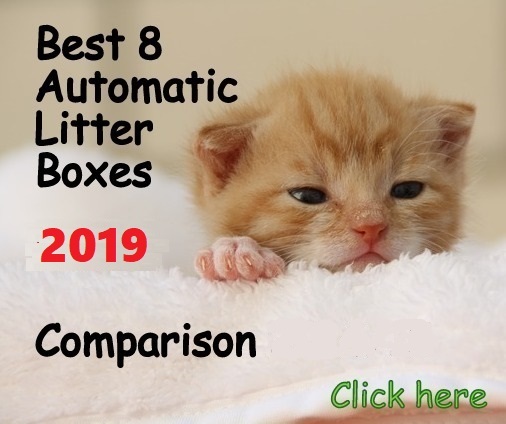 Even though this automatic feeder is excellent, it is not cheap. This combo does not come with a digital timer (you can use your own digital timer or get the combo below). If a power outage occurs using the Super Feeder with analog timer, the unit will retain the programmed cycle feeding times (for example 4 times a day), but the feeding times may be off schedule. Don’t install this food dispenser stand outdoors, the stand set up is for indoor use only. However, you can customize your installation of this unit to use it outdoor by building a special covered protection to it. The nice thing about the Super Feeder CSF-3XL is that it can be mounted on a wall and with the extra hopper it gives you several weeks worth of food. To assemble it, make sure to have a small and medium Phillips tip screwdriver. Best accuracy in portions with small 1/4″ diameter spherical pellet. NOTE 1: You can find the exact same combo with digital timer this review is for CSF-3XL with analog timer. NOTE 2: The combo with digital timer retains cycle feeding times and the exact feeding schedule in case of power outages and it can be programmed up to 8 feeding cycles by day with 3 minutes apart between each meal if you want. 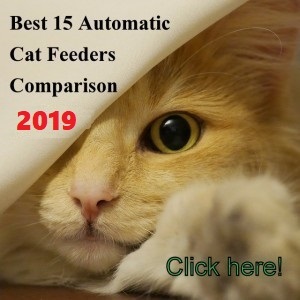 If you feed your cat small spherical size pellet 1/4″ diameter (the Super Feeder also works with pellets up to 1/2″ diameter size and in this case, you will have to adjust portions through trial and error method). If your cat is overweight. If your cat is obsessed with food. If you have two cats that can eat together. If you have to stay several days away from home. Looks like a great solution if you are going to be away. How long can you leave your cat with a feeder like this? Can you leave them for a vacation period, like 2 weeks or just a couple of days? 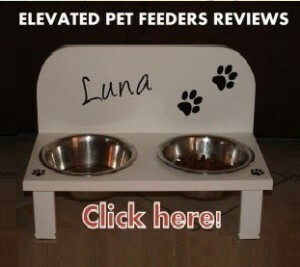 If you correctly setup this feeder and with the big hopper full of food, you could leave your cat alone for 3 or 4 days. 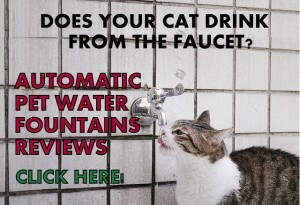 This is about food, but it is always a good idea to ask somebody take a look of your cat if anything unexpected happens. They sometimes get stuck with the claws on the curtains and could die by starving.